Depending on when your home was built, the plumbing system is going to match the era. A house from 1900s will use lead, while a house before 1970 may use galvanized steel. Unfortunately, both of those pipes are no longer safe to use in homes. That calls for repiping. Copper: If you had to take any guess about what pipes are made of, there’s a strong chance you would have guessed “copper” correctly. Copper is very common in modern plumbing, mostly because of how versatile and durable it is. Thanks to its malleability, it’s capable of withstanding shifting soil. Copper pipes can withstand cold and hot temperature and will last for several decades. CPVC: These pipes can withstand heat better than standard PVC pipes. This makes them perfect for use in hot water lines. However, they’re not as durable as copper, which often makes PEX the better choice. PEX: These pipes are highly flexible, which makes them ideal for installation in tight corners. Not only that, but they’re less expensive than copper and they last longer than CPVC piping. It’s also capable of resisting corrosion from acidic water; something that copper can’t promise. The sewer line is what transports your wastewater out of the home and onto the sewer. These lines run underground and need to resist shifting soil and tree roots. Often, the reason that sewer lines burst and need repair is because they’re made from older materials that are beginning to break down. Clay: The benefit of clay piping is that it will resist degradation better than plastic. 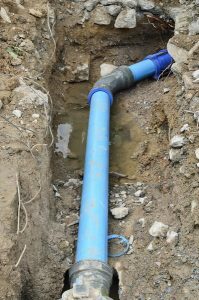 Many homes still have a clay sewer line, and some plumbers even install it, but it’s not something you’ll find in the hardware store. However, clay can attract tree roots, which can lead to a crack and eventual burst. Cast-iron: An older style of sewer line piping that is beginning to expire in many households. It’s very strong and can accept pressures that would normally break a clay or plastic pipe. Plastic: Comes in either ABS or PVC. Their material makes them great for transporting waste as well as for resisting roots. Orangeburg: While once favored for being lightweight and easy to install, these pipes are expiring sooner than their counterparts and have fallen out of use. For more info on your plumbing system in Santa Barbara, CA, speak to one of our experts. Contact Husted Plumbing today.